World War I introduced many advances in science and technology into modern warfare. These advances changed the nature of warfare including battle strategies and tactics. Scientists and inventors on both sides worked throughout the war to improve weapon technology in order to give their side an edge in the fight. 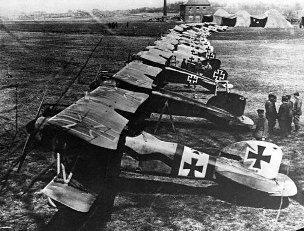 World War I was the first war where the airplane was used. Initially, airplanes were used to observe enemy troops. However, by the end of the war they were used to drop bombs on troops and cities. They also had mounted machine guns that were used to shoot down other planes. Tanks were first introduced in World War I. These armored vehicles were used to cross "No Man's Land" between the trenches. They had mounted machine guns and cannon. The first tanks were unreliable and hard to steer, however, they became more effective by the end of the war. Much of the war along the western front was fought using trench warfare. Both sides dug long lines of trenches that helped to protect the soldiers from gunfire and artillery. The area between enemy trenches was called No Man's Land. Trench warfare caused a stalemate between the two sides for many years. Neither side gained ground, but both sides lost millions of soldiers. The most dangerous ships during World War I were large metal-armored battleships called dreadnoughts. These ships had powerful long-range guns, allowing them to attack other ships and land targets from a long distance. The main naval battle in World War I was the Battle of Jutland. Besides this battle, Allied naval ships were used to blockade Germany to prevent supplies and food from reaching the country. World War I also introduced submarines as a naval weapon in warfare. Germany used submarines to sneak up on ships and sink them with torpedoes. They even attacked Allied passenger ships such as the Lusitania. Artillery - Large guns, called artillery, were improved during World War I including anti-aircraft guns to shoot down enemy planes. The majority of the casualties in the war were inflicted using artillery. Some large artillery guns could launch shells nearly 80 miles. Machine gun - The machine gun was improved during the war. It was made much lighter and easier to move around. Flame throwers - Flame throwers were used by the German Army on the western front in order to force the enemy out of their trenches. 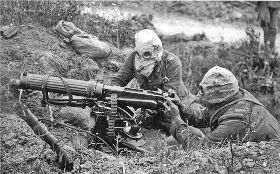 Chemical weapons - World War I also introduced chemical weapons to warfare. Germany first used chlorine gas to poison unsuspecting Allied troops. Later, the more dangerous mustard gas was developed and used by both sides. By the end of the war, troops were equipped with gas masks and the weapon was less effective. Tanks were initially called "landships" by the British. They later changed the name to tank, which was what the factory workers called them because they looked like a large water tank. The main form of transportation of troops during the war was the railroad. Armies would build new railroads as they advanced. British soldiers in the trenches used a bolt-action rifle. They could fire around 15 shots in a minute. Large artillery guns needed as many as 12 men to aim, load, and fire them. The first tank was the British Mark I. The prototype of this tank had the code name "Little Willie."